Wild Rice Harvest Bowls with Fig Balsamic Vinaigrette are full of healthy, fall-inspired ingredients. Make a big batch then enjoy for lunch all week long! I think it’s finally safe to say that fall is in the air around here! Red and orange leaves are scattered on the ground, yellow and fuchsia mums decorate nearly every porch on the block, and I’ve traded in my sandals and tank tops for slip on Chucks and a denim jacket. Coincidentally the 80s called and want their fashion trends back. Weird! Trips to the grocery store are almost too adorable to bear right now too. Sugar pumpkins, mini squash, and lumpy gourds greet us at almost every turn of the cart, begging me to take them home. Alas, I have no design sense and they’d just sit in an awkward pile on my table. One fall favorite I DO know what to do with though, is the abundance of squash sitting next to the wee pumpkins. Come to Mama, Wild Rice Harvest Bowls with Fig Balsamic Vinaigrette! Guys, I’m over the moon for this beautiful, delicious dish and am so excited to share it with you today, especially, because you can make it over the weekend then pack the leftovers for easy, healthy lunches all next week – this dish holds up beautifully in the fridge! 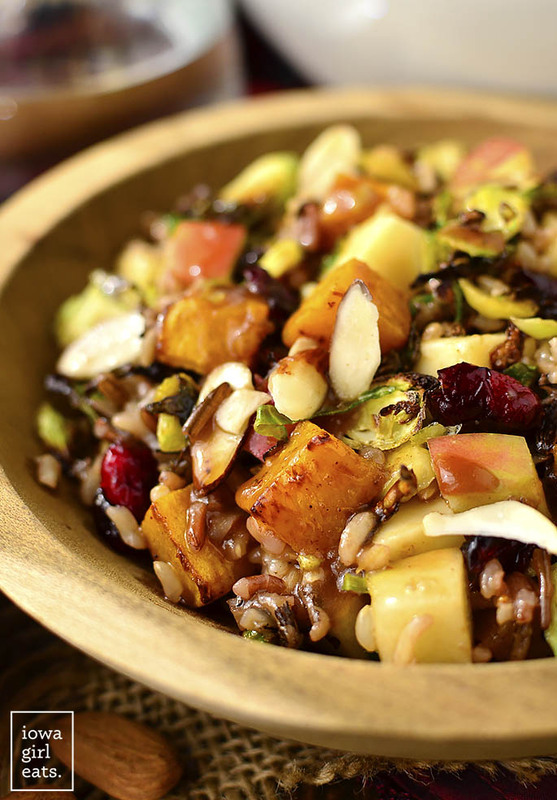 Let’s get specific: hearty wild rice is tossed with my favorite fall food pairings – cinnamon and spice roasted butternut squash and brussels sprouts, chopped apples and cheddar, chewy dried cranberries and almonds – then drizzled with homemade sweet and tangy Fig Balsamic Vinaigrette. The results are outstanding. If you like wild rice salads than you’ll love this fall version that’s full of craveable flavors and textures. I can’t get over how healthy it is and how perfect the leftovers are to take for quick and easy lunches to eat straight from the fridge. I did keep these bowls meatless since I don’t always require meat at midday myself (who am I kidding, Applegate salami is bae,) but feel free to add chopped seared chicken or even pork for more staying power. 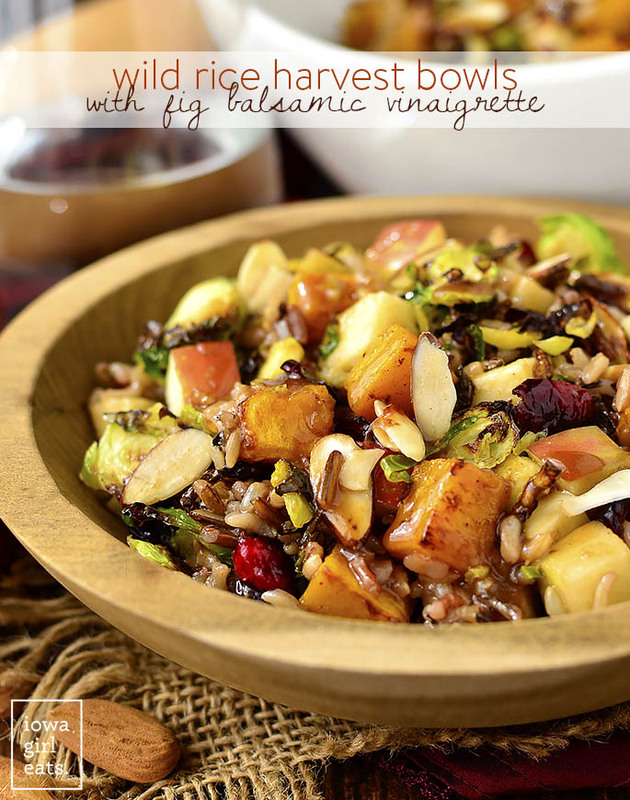 Now go forth and make Wild Rice Harvest Bowls with Fig Balsamic Vinaigrette – one of the best ways (besides Ginger & Apple & Bourbons ?) to celebrate this fabulous and delicious season! Start by cooking 1 cup wild/brown rice blend in 1-3/4 cup chicken broth according to package directions. 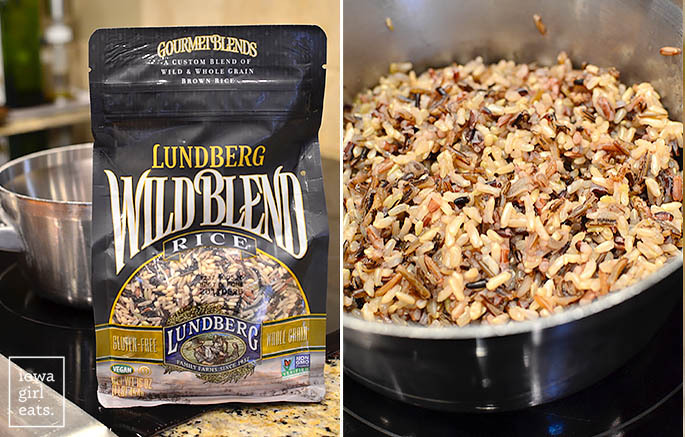 I love this Lundberg Wild Blend Rice – it’s what I use for my Crock Pot Chicken and Wild Rice Soup, too! Spread the rice out onto a plate to cool slightly or make a day ahead of time and refrigerate. 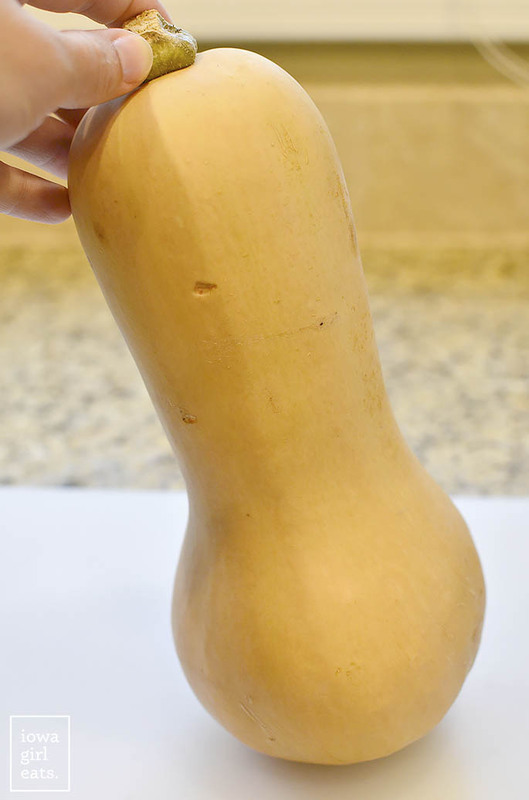 While the rice is cooking, prep 1 small(ish) butternut squash. As we talked about in our “How to Eat Healthy on a Budget” post, eating seasonally is great for the pocketbook. Organic squash is selling for $.99 at the regular grocery store right now because it’s in-season and abundantly available, aka time to stock up. 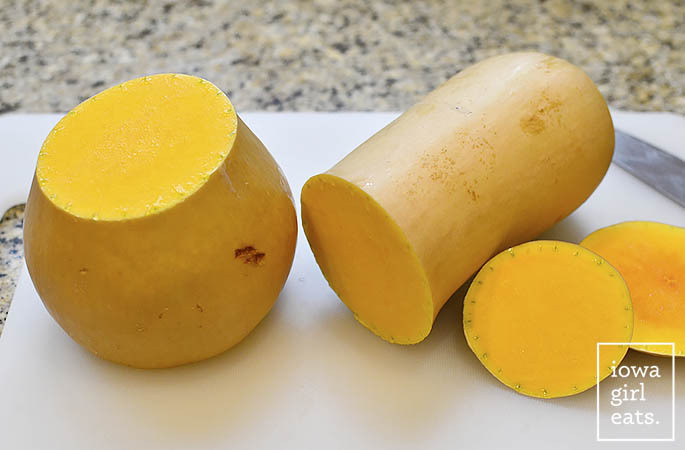 Slice the top and bottom off the butternut squash then slice in half and use a vegetable peeler to peel the skin from the long neck. I prefer to use a sharp knife to peel the bulb end as it’s easier to follow the curve then trying to hack away at it with a peeler. Slice the squash into planks, then each plank into strips, and finally each strip into 1″ cubes. By the way, I’ve said it before and I’ll say it again, it’s so funny how different individual squash can be! The one I sliced into to photograph for this recipe was bright yellow (Lincoln asked if it was cheese!) and not extremely sweet, while the one I used for this Roasted Balsamic Butternut Squash was sweet as candy and pumpkin-orange. The consistency issue is slightly annoying, but also kind of…fun/funny? I need a nap. Anywho, measure out 3 cups of 1″ cubes then add to a silpat or nonstick sprayed foil-lined baking sheet and toss with 1-1/2 Tablespoons extra virgin olive oil, 1/8 teaspoon each garlic powder, chili powder, and cinnamon, plus lots of salt and pepper. None of these seasonings are overwhelming, by the way, they just add a little somethin’ somthin’, and I loved the little hints of cinnamon I occasionally got when eating these Wild Rice Bowls. Roast the butternut squash for 15-20 minutes at 400 degrees, stirring halfway through. After stirring, put the squash back into the oven along with a sheet pan of 9oz shredded brussels sprouts tossed with 1-1/2 Tablespoons extra virgin olive oil, salt and pepper. The brussels sprouts will get nice and crispy in 8-10 minutes, which means they should be done at the same time the squash is – weewho! 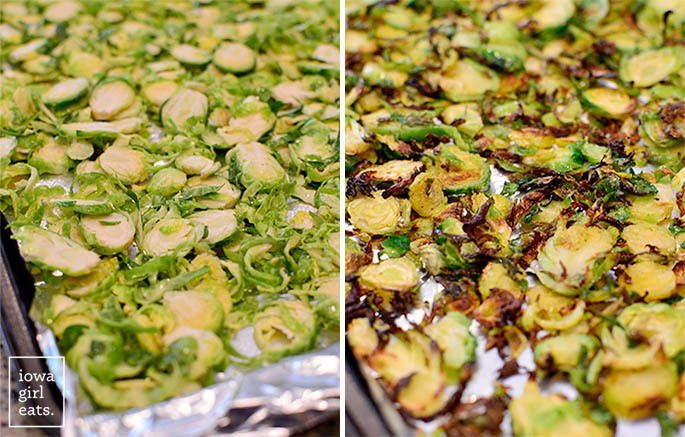 Let both the squash and brussels sprouts cool slightly – you can also roast both a day ahead of time. By the way, I am totally digging these pre-shredded brussels sprouts for this dish. 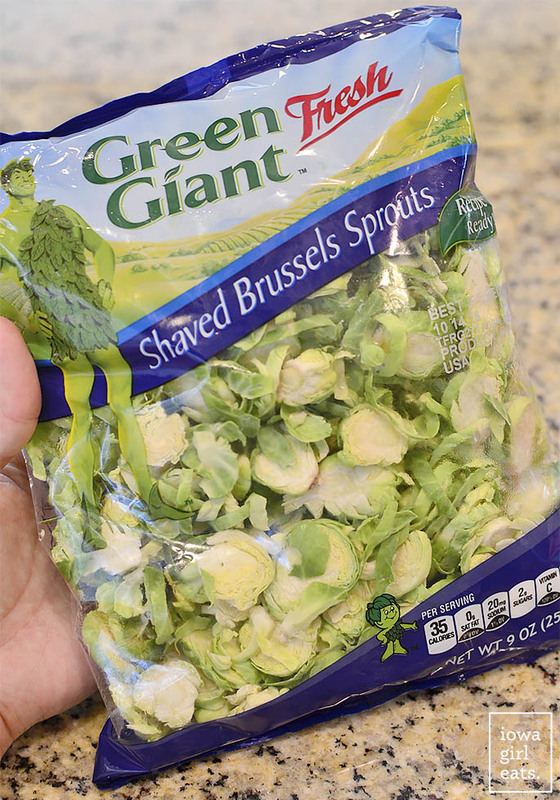 I find them to be too thick for salads with raw brussels sprouts, but they’re the perfect thickness for roasted dishes and save SO much prep time. Once the rice, squash and brussels sprouts have slightly cooled, add them to an enormous (don’t say I didn’t warn ya’!) 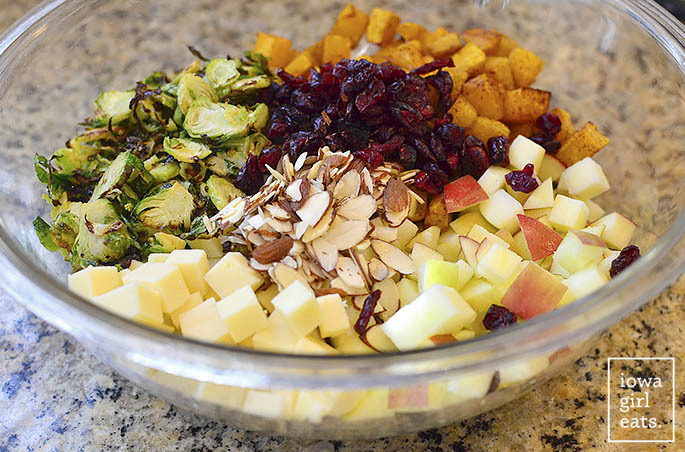 bowl with 1 large or 2 small chopped apples, 3oz cubed white cheddar cheese, 1/3 cup dried cranberries, and 1/3 cup sliced almonds. 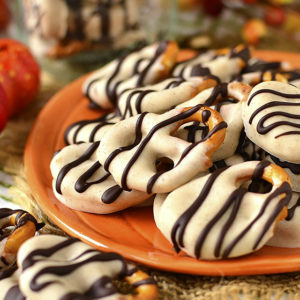 By the way I think pepitas would be fantastic in place of the almonds, they’re just really hard to find gluten-free. Last step is to drizzle on a homemade Fig Balsamic Vinaigrette (which is as good as it sounds!) and toss to coat. That’s just 1/2 cup extra virgin olive oil shaken with 1/4 cup balsamic vinegar, 2 Tablespoons fig jam (I like Dalmatia – usually found in the speciality meats/cheeses section of the grocery store,) 1 minced garlic clove, salt, and pepper. 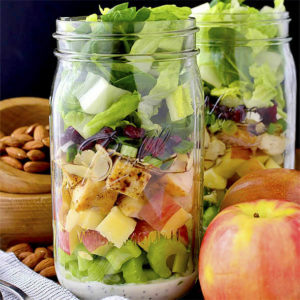 Eat right away or portion into containers to eat for delicious lunches all week long. Enjoy, enjoy! Add rice and chicken broth to a small saucepan then bring to a boil, place a lid on top, then turn heat down to a simmer and cook for 40-50 minutes or until rice is al dente (verify liquid amount and cooking method with rice package directions.) Set aside to cool slightly - can be done a day ahead of time. Preheat oven to 400 degrees. Line a half sheet pan with a silpat or foil then spray with nonstick spray if using foil. 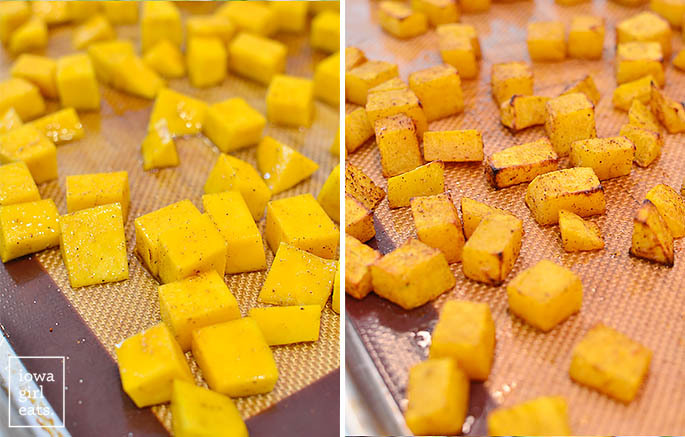 Add butternut squash cubes, 1-1/2 Tablespoons extra virgin olive oil, garlic powder, chili powder, cinnamon, salt, and pepper then toss with your fingers to evenly coat. Roast for 15-20 minutes, or until squash is tender, stirring halfway through. Set aside to cool slightly - can be done a day ahead of time. Meanwhile, line another half sheet pan with a silpat or foil then spray with nonstick spray if using foil. Add shredded brussels sprouts, remaining 1-1/2 Tablespoons extra virgin olive oil, salt, and pepper then toss with your fingers to evenly coat. Add to oven after stirring the squash then roast together for 8-10 minutes or until brussels sprouts are tender and golden brown. For the Fig Balsamic Vinaigrette: Combine ingredients in a bowl or jar with a tight fitting lid then whisk or shake to combine (might need to microwave for 15-20 seconds to help melt the fig jam.) Taste then add more salt, pepper, and/or fig jam if desired. 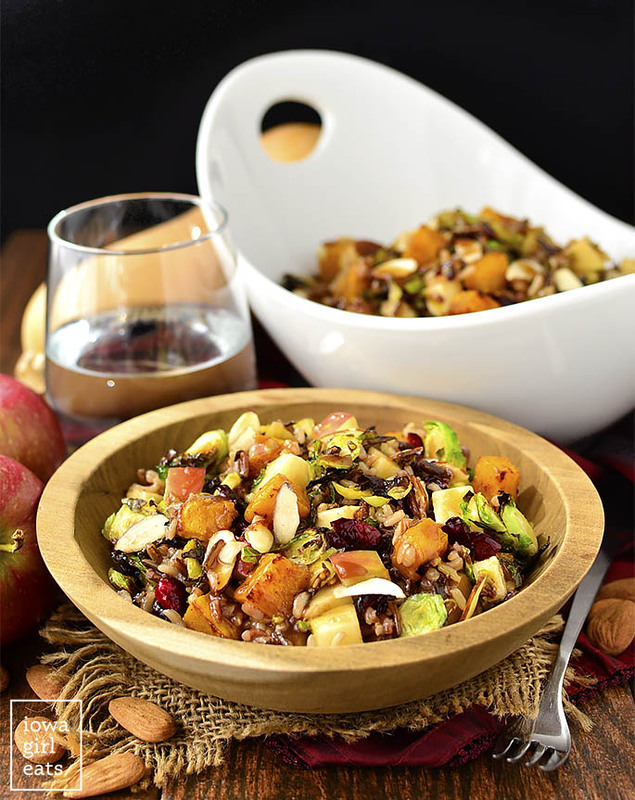 In a large bowl combine cooked rice, butternut squash, brussels sprouts, apples, cheese, almonds, and dried cranberries. Drizzle Fig Balsamic Vinaigrette on top then toss to coat and serve. Leftovers are good for 3-4 days. this looks AMAZING! I can’t wait to make it this weekend for lunches next week! Thanks for this! Oh my this looks amazing. I’m always on the lookout for salads not based on greens because I have an intolerance to lettuce. I think I’ll make for lunches next week. This looks so yummy! Any thoughts on what could be a reasonable substitute for the fig jam?!? This looks so good. 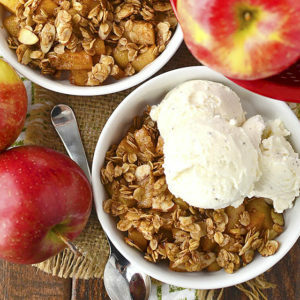 It’s Fall in a bowl! Question though: if I plan to make ahead and pack servings for lunch, should I keep the dressing on the side? Nope you can toss it all together! Since the rice is warm/cold when you add the dressing it won’t soak too much of it up. what a fun colorful bowl!! 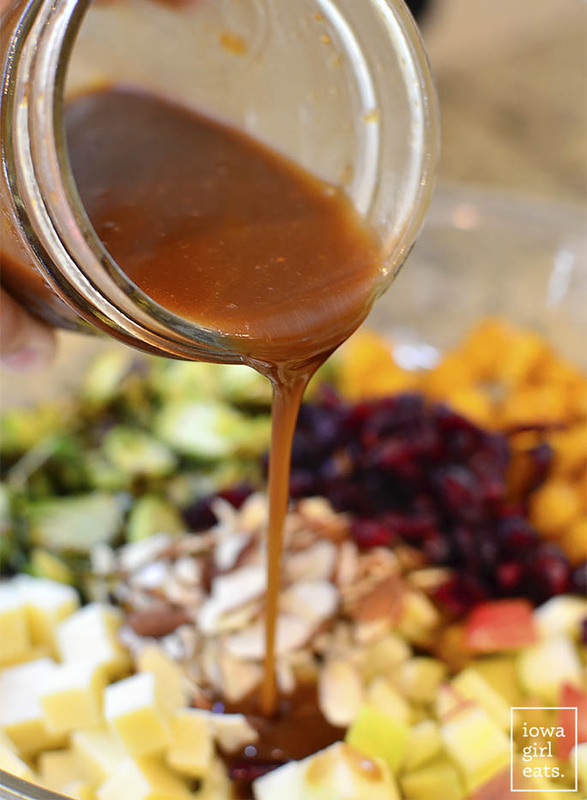 <3 cant wait to try your fig dressing too…that sounds amazing! Oh yum! I was just thinking how I need to get better about packing my lunch for work–this looks like perfect motivation!! Do you find those brussel sprouts at Hy-Vee?? How do you make Fig Jam? Love your recipes. Hi Diane! I buy it at the store near the specialty meats and cheeses. I love this idea! I am printing the recipe to make soon. Hope you are feeling well. Would you say this dressing is on the sweet side? Oops! I just saw it says the dressing is sweet and tangy. I made this (ish) for dinner tonight using what I had on hand and it was delicious! The flavor/texture combo was amazing! I used pomegranate seeds instead of dried cranberries and quinoa instead of wild rice-yum! I LOVE the pomegranate sub – great idea!! Oh Kristin, these looks amazing! I’ve been struggling with healthy lunches lately (lunch salads are like so dead to me right now) and this looks absolutely perfect! Seriously cannot wait to make these tomorrow for lunches next week. Thanks for another great recipe and have a fun weekend!
? I totally feel you – sometimes you just get to the point where you literally cannot eat another cold lettuce salad…! 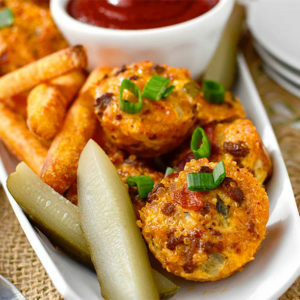 This is such an Iowa Girls Eats quintessential recipe – the kind I come here for! Absolutely love this – sounds yummy! I can’t have vinegar right now…do you think lemon juice would work as a sub for the balsamic in that dressing? Looks so good! This is fall flavours at their best on a plate! 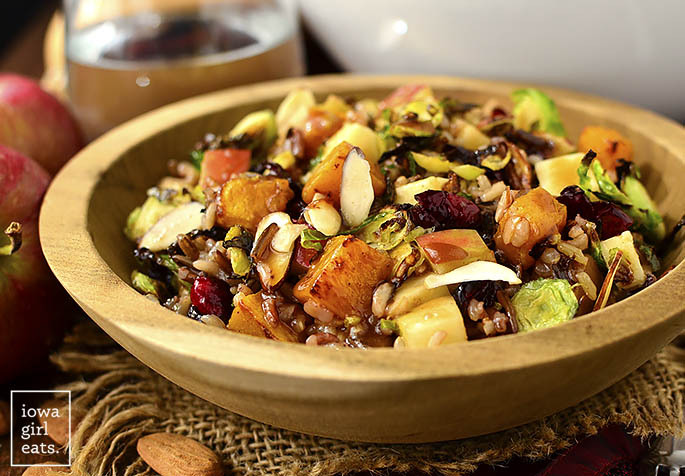 Love the combo of squash, cinnamon, apples, cranberries, fig +Brussels sprouts, can’t wait to try it! Love these healthy, hearty salads that are filling enough to be eaten as a weekday lunch. Oh man, I gotta make this!! 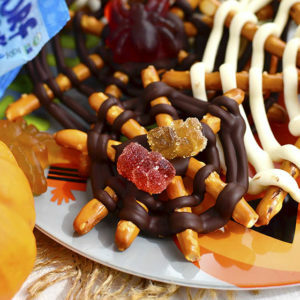 This is like fall in one bowl! SO excited!! Pro tip for anyone packing this for lunch – it tastes much better when you leave it out of the office fridge for a bit so its at room temp when you eat! Thanks for another great recipe Kristin! This recipe looks delicious! I have a bunch of dried figs I want to use up and was wondering if you think I can substitute those for the fig jam. Maybe blending them with some water? Sounds like a plan! I might soak them in warm water for 10 minutes first to help soften, too! I love this salad! I have made it a few times and I never tire of it..keep em coming! Hey Pat! I’ve never tried but I think that could be good! I can’t find fig jam….first time I made it with homemade strawberry/rhubarb jam….and tonight is made using homemade strawberry red pepper jam! SOOOOO GOOD! I love this recipe! I just wish I could find the sliced brussell sprouts here in Airdrie, Canada. Knock on wood, haven’t lost a finger yet to the mandolin! Ooo, that spicy/sweet jam sounds fabulous!! So glad you enjoyed, Sarah!! Love your recipes. All that’s missing is the sodium content. Keep up the good work! Just wanted to tell you that I took this salad to MOPS a couple weeks ago and I had a ton of people asking for the recipe. Everybody loved it!! Thanks for sharing such good recipes!! This looks amazing!!! I want to make this next weekend when my friend and I go to Vail. She’s allergic to squash. Do you think I could sub sweet potatoes? What a delicious salad. I made this yesterday for tonight’s supper and I couldn’t stop sampling it. It is a terrific recipe for us in Florida because it has all of those fall flavors without being too heavy for the warm weather. I thought the fig jam in the dressing was brilliant- so yummy! 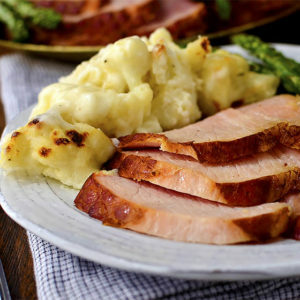 Thanks for another great recipe, we’ll be having the turkey sandwiches later this week. Yes, that’s such a great feature of this salad – I’m so glad you enjoyed it, and thank you for leaving a star rating, too! This isn’t amazing! I have made it twice now. So glad to hear it, Vera! Thanks so much for your feedback! Hi from Washington state! I’ve made this recipe twice for potlucks and both times it was a HUGE hit. Honestly, people at work still talk about it a month later. The only substitution I made was subbing apricot jam for the fig. I’m a born and raised Iowa girl, and my mom turned me on to your site. Keep up the great work! Ahh, you made my day. Thank you so much for the nice note and feedback, Becky! Would it be good without the cheese? Looking for more of a vegan spin on it! Kristin, do you think this would work with brown rice, rather than wild rice? The years before my celiac diagnosis almost destroyed my digestive system and wild rice is an absolute no. Quinoa is, tragically, another casualty. The flavors sound fantastic. Im not a huge fig fan. What would you suggest in place of the fig jam? Could you use strawberry or raspberry? I made this tonight, and my super picky husband looooOOOOOoooved it. That NEVER happens. Please don’t ever stop making new recipes. 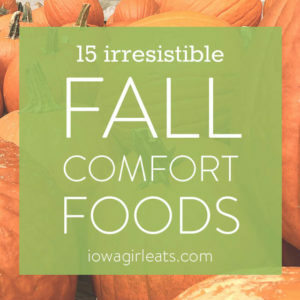 I swear 3/4 of my go-to’s are Iowa Girl Eats recipes. ❤️ Lots of love from Iowa City. This looks absolutely delicious! I am just curious if it’s served warm or cold. You can serve either! I usually serve warm for dinner or chilled for lunch. So, so good. I kept everything separate (adding chicken and pomegranate arils) so my kids wouldn’t complain and everyone could just put on what they liked. We ate it warm. So good! Oh, one other thing – I thought the balsamic overpowered the fig so I doubled the oil & fig. Prob just my vinegar and/or jam though, not a critique! Thanks for all you do!